Bok Choy, Nappa (Chinese cabbage), Mustard Cabbage, Water or Chinese Spinach and Chinese Broccoli. Ethnic greens are a good source of Vitamins A and C and potassium. These greens are native to central Asia, having originated there centuries ago. They are widely used in the cuisines of Thailand, Laos, the Philippines, Vietnam, Korea, Singapore and Malaysia as well as China. They have been introduced to the Western world wherever native Asians have settled. Look for firm dense bunches of nappa and bok choy with smooth stems and unwilted leaves. The more delicate Chinese broccoli should be supple, unwilted and have a vivid, clear color. 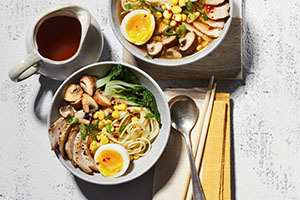 Nappa, bok choy and mustard cabbage are all members of the cabbage family. They will keep well for a week, wrapped in plastic at the bottom of the refrigerator. Chinese broccoli and spinach can be stored in the same way but will wilt and dry out if not used soon after purchase. 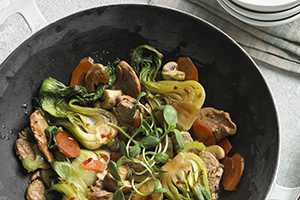 Cut chunks from the stem ends of bok choy and nappa to add to a stir-fry. They'll cook in a few minutes but their leaves only need about 30 seconds to cook. Add them to salads, or use them in braised dishes or soups. They're also suitable with roast pork, beef and duck. They go well with such flavorings as soy, tamaris and oyster sauces, and with ginger, garlic and various hot spices. Chinese broccoli and other more delicate greens can be used in the same way, but need less cooking time.